Be among the first to get your hands on the 2017 1 oz Australian Stock Horse Silver Coin. The latest edition in the hugely successful Stock Horse series by the Perth Mint, this 2017 coin depicts one of the country’s best loved animals. Struck from fine .9999 Silver, the coin is an excellent example of the mint’s dedication to high quality, exceptional workmanship, and outstanding attention to detail. The Stock Horse Series was launched in 2013 and each edition has a limited mintage of just 10,000 coins worldwide. Previous Silver 1 oz Australian Stock Horse Coins have engendered massive interest around the globe and the 2017 looks set to emulate their success. Each of these beautiful coins honours the stock horse, an animal that is known for its loyalty, endurance, and stamina. These exceptional horses were first used by explorers who needed to access some of Australia’s most inhospitable regions. Their reputation for strength and courage lead to over 120,000 of them serving their country in the First World War. The Perth Mint celebrates the stock horse with a limited-edition coin that features a new design for 2017. The coin has a ridged edge and carries the ‘P’ mintmark of the Perth Mint. 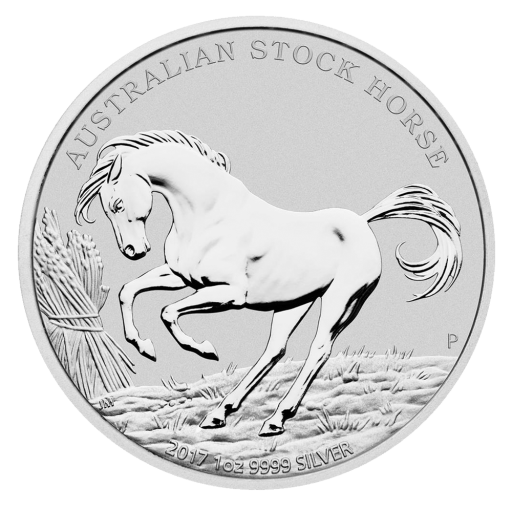 Why choose the 2017 Silver 1 oz Australian Stock Horse? As part of a popular and limited series, the 2017 Silver Australian Stock Horse 1 oz coin is a smart choice for investors as well as collectors. Silver is traditionally one of the safest precious metals for investment purposes, and the relative rarity of these coins also enhances their appeal. Buy the 1 oz Silver Australian Stock Horse 2017 edition with CoinInvest and enjoy fast, efficient service and insured delivery. Because we are trusted suppliers for many of the world’s most famous Mints and refineries, including the Perth Mint, you’re always guaranteed the most competitive prices.